Choosing new eye-wear has never been easier. Significant improvements in lens technology means that glasses are now better looking, more comfortable to wear and give you much better vision. As an independent optician’s practice, we are free to select the best lenses from any manufacturer. This means that we can offer you a wider choice, alongside a highly personalised service that caters for your individual needs. 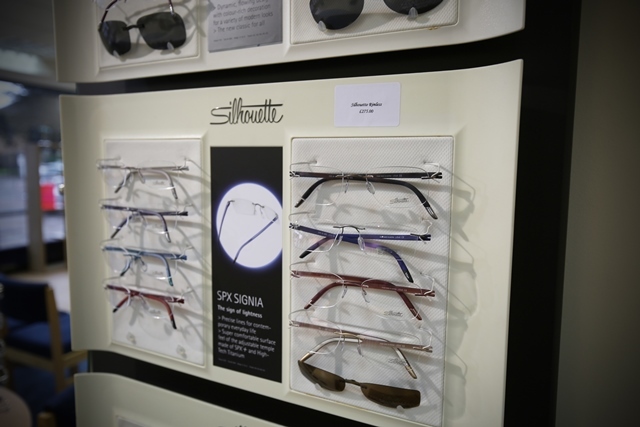 Eyewise is an authorised stockist of the renowned frame Silhouette – boasting numerous collections of rimless styles that marry the functionality of glasses with the mood of the occasion. Designer frames by Lacoste, Chloe, Ted Baker & Ann et Valentin are also available to view in practice. If you have impaired vision, the practice stocks a wide range of magnifiers and aids. Our experts can also given you advice on special reading lamps that can improve and enhance your reading experience. For those of you who wear glasses whilst playing active and recreational sports, there is a wide selection of sports eye-wear from Adidas. These provide various filter lens options and prescription lens choices. Eyewise is also an authorised stockist of Maui Jim sunglasses. These are arguably the best sunglasses for eye protection and glare reduction. This is a result of its unique polarised lens technology. Now, Maui Jim have created a new brand of sports and fashion sunglasses, Zeal Optics, suitable for sports such as mountain biking, climbing or surfing. The plastic used to make these frames is plant based, making this a unique and environmentally friendly. They still use the same polarisation lens technology as the renowned Maui Jim sunglasses. Ski goggles, prescription swimming goggles, and safety spectacles are also available for purchase.